"Won't I risk losing my home if I file for bankruptcy protection?" One thing many do not understand about bankruptcy is that you normally DO NOT lose your property when you file to eliminate debts. And this is particularly true for the place where you live. For Minnesota residents, you generally are eligible for a $420,000 homestead exemption (and up to $1,050,000 for agricultural property). There are certain restrictions, but in general you can apply this exemption to one parcel where you actually reside. And note that the exemption is for your equity in the property. So, if you have a mortgage or mortgages encumbering the parcel, your exemption applies to the net value of your home after deducting the balances still owed on any mortgage debt. So if your Minnesota home has a value of $500,000, but you have a $100,000 mortgage, you can still exempt all of it under the statute. Meaning you can still use bankruptcy to keep the entire value of your home - free and clear - while discharging other, unsecured debts. Suppose you missed ten months of mortgage payments - perhaps because you were out of work or experienced some other short-term income loss. You're going to lose your home, right? Wrong. A Chapter 13 reorganization can compel the mortgage lender to cancel any pending foreclosures and accept payments on the past-due mortgage amount over time: up to five years. So if you're $12,000 behind on mortgage payments, you could conceivably schedule a catch-up, repayment plan at $200/month over five years and avoid a foreclosure. Note that your Chapter 13 would involve other fees - attorney's fees for filing and managing your case plus trustee fees - but you can often spread some of those costs out over the length of the Chapter 13 plan. You can also use the Chapter 13 process to reorganize any other debts you have, potentially saving you big time on other loans and protecting your home equity at the same time. "What about the [town home / house / condo] that I'm renting out right now? That's gone, right?" What if you happen to own "investment property": real estate that you rent but do not use as your residence? Won't you lose that for sure if you file for bankruptcy protection? Not necessarily. While a bankruptcy trustee will take a hard look at any investment property you own, the trustee is also going to be pragmatic about the costs of getting involved in your investments. First, you might be eligible for a "wild card" exemption to exempt some of the value in your investment - sometimes as much as $10,000 or even slightly more than that (call us if you have questions about how the "wild card" exemption works - it's somewhat complex). That exemption comes off the top and must be paid to you if a trustee elects to sell your investment. Second, the bankruptcy trustee is going to take into account the costs of sale plus any tax consequences (capital gains on any appreciation). The net value of your property - fair market value minus any mortgage loans, and minus any "wild card" exemption - might be relatively small when the costs of sale are included. In that case, a trustee might not bother trying to sell it at all, meaning you would get to keep it. Or, a trustee might be willing to negotiate with you - giving you the opportunity to keep the investment property if you agree to pay part of its value. The important thing to know is that there are often options and you need to evaluate those before you file. Whether you own residential real estate or investment property, do not assume that you will lose it if you file for bankruptcy protection. In many cases the opposite is true. Americans owe over $1.48 trillion in student loan debt, spread out among about 44 million borrowers. Recent estimates put that at about $620 billion more than the total U.S. credit card debt. The average Class of 2016 graduate has $37,172 in student loan debt, up six percent from the previous year. As you may already know, it it can be very difficult to discharge any student loan debt in a bankruptcy proceeding. I always review that as an option for my clients with student loan debts. But you generally have to have a disability or some other condition that makes it very difficult for you to earn income before you can discharge any student loan debts in bankruptcy (at least in the Minnesota District - standards vary in other bankruptcy Districts in the U.S.). So what can you do if you are overwhelmed with student loan debt? Currently, the Department of Education offers four income-driven repayment plans to borrowers who qualify. Eligible loans include Direct Loans, Direct PLUS Loans made to graduate students, Federal Stafford Loans, and some Family Education Loans. Older Perkins loans might also be considered. The advantage to IBR is that is lowers your monthly payments and your loans will be eligible for forgiveness if you still have a balance at the end of the repayment period. Pay As You Earn plans also require that your prospective payments be lower than they would be on the Standard Repayment Plan. But they can offer better terms that IBR, with payments closer to 10 percent of your discretionary income, and forgiveness of remaining principal after 20 years of payments. The catch is you must be a relatively new borrower. Your first loan must have originated no earlier than October 1, 2007, and you must have received a disbursement of a Direct Loan on or after October 1, 2011. RPAYE is the newest type of repayment plan; it became available on December 1, 2015. As the name suggests, RPAYE is similar to Pay As You Earn plans, with two key differences: (1) you can qualify even if your first loan was before October 1, 2007, and (2) there is a "financial need" test under PAYE that you do not need to satisfy to qualify for RPAYE. Thus, RPAYE will be available to more borrowers. RPAYE repayment terms are normally 10 percent of discretionary income for 20-25 years (the 25-year term is primarily for those with graduate or professional student loans). And your spouse's income is taken into consideration to determine what you can afford to pay. Like RPAYE, Income-Contingent Repayment plans do not have an income eligibility requirement. ICR plans can also include some parental loans if they were consolidated. Normally, ICR plans have the broadest scope. If you do not qualify for one of the other repayment plans, you might still qualify for ICR. But the repayment terms are not as good: generally 20 percent of discretionary income with a 25 year term. Also, there are some stricter loan forgiveness rules under ICR. Which Plan Is Right For You, IF ANY? You can start with the tools available at StudentLoans.gov (look for the "Repayment & Consolidation" tab). Some things to consider before starting a plan: (1) the kinds of loans you have must fit within the eligible categories, (2) you might end up having to pay taxes on the forgiven amount at the end of the plan - assuming current tax laws do not change before then, and (3) you might end up paying more in interest than you would if you kept making the standard payment amount. But if you qualify for a repayment plan, it can often make a very difficult situation much more manageable. *In general, your "discretionary income" under any repayment plan referenced in this article is equal to the difference between your annual income and 100% of the federal poverty guideline for your family size and State of residence. Credit repair companies are known to play on your fears that bad credit will stand in the way of your dreams. They'll make you think that bankruptcy is the end of the world. The truth is, filing for bankruptcy can actually raise your credit score. The reasons are pretty simple: (1) after bankruptcy, you likely won't owe money to anyone (other than non-discharged tax debts, student loans, or domestic support obligations), (2) new lenders know that you don't have any open accounts you can use, and (3) you won't be able to file bankruptcy again anytime soon. When you take these these three factors into account, you’re a better credit risk after bankruptcy than you were before you went into the process. BUT, your credit score will not improve if there are errors on your credit report. About three to four months after bankruptcy, go to AnnualCreditReport.com to get free copies of all three of your credit reports. If you find any errors, it's important that you take some simple steps to correct them. TIP: remember to save or print each report right away, otherwise, you might have to pay for a second look. Once your bankruptcy case ends, all debts need to be updated to show a $0 balance due. If something doesn't look right, send a "dispute" to the credit reporting agency. Follow the instructions on each credit bureau's website - look for a link on the home page marked "Disputes". Follow the instructions carefully and send a copy of your bankruptcy discharge papers if requested. Send the letter by certified mail. Keep a copy of the original signed letter and the certified mail receipt card. The credit reporting agency usually responds in 30-60 days, but it could be a longer or shorter. You have now saved yourself a lot of money and time because you did it without hiring a credit repair company. Frequently, the credit repair agencies simply complete the above steps and charge you a pretty penny to do it. It's just not worth it when the relatively simple process is explained on the credit bureau websites. Worse, though, are those credit repair companies that don't follow the dispute mechanism through the credit reporting agencies. Instead, they send the disputes directly to the individual creditors. This can cause a short-term credit improvement. But the creditors can later upload another set of data to the credit reporting agency that reinstates the debt on your report. In other words, the credit repair agencies only fix things temporarily. This is a tactic many credit repair agencies use to temporarily remove accurate debt information from your credit report. But the bad marks will eventually reappear. 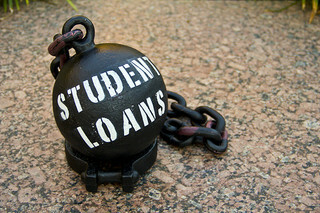 Current U.S. laws do not allow most student loans to be discharged in bankruptcy. So what can you do to deal with them? And what, if anything, happens to them if you do file for bankruptcy protection? It mainly depends on what kind of bankruptcy you file: Chapter 7 or Chapter 13. Chapter 13 is sometimes called a "reorganization" or payment plan bankruptcy, where you agree to pay back at least part of your debts over time. Some of your debts will get better treatment than others and can be paid in full, such as priority income tax debts. Student loans are normally classified as "nonpriority unsecured debt", which means they're treated just like credit card debt and do not have to be paid in full. This means that you are not required to pay off your student loans in a Chapter 13. The bad news is that while any remaining balances on other debts, like credit cards, can be discharged at the end of a Chapter 13, your student loans are not. And the interest keeps accruing on the student loans during your bankruptcy case. So while you may gain significant relief on your other debts in a Chapter 13, you'll likely finish your Chapter 13 payment plan with student loan debts that are similar in size to when you started. This all probably sounds pretty bad. But Chapter 13 can still be helpful to folks with student loans. You can use Chapter 13 to buy yourself time to take care of other debts, and then focus on what to do about any remaining student loan debt afterwards. There are various income-based repayment programs available - call my office if you'd like to learn more about them. What about Chapter 7? In a Chapter 7 case, your student loans will not be discharged unless you file a separate Complaint to Determine Dischargability, where you're essentially asking the bankruptcy judge to eliminate your student loans, in part or in total, due to an "undue hardship." The lender (or its guarantor) will almost always object. The U.S. Department of Education has written a letter telling lenders exactly how they can object. This means you're likely in for a full-blown trial in front of a bankruptcy judge. Most of the time it boils down to showing that you are so impoverished and so deep in student loan debt that it would be impossible for you to pay your student loans off while maintaining a minimal standard of living. It's a tough thing to prove but there are cases where relief has been granted. If you can see no way to pay off your student loans over the next 10-20 years, give us a call. We can assess your situation for free and discuss your options. What Should You Do When You are Sued for a Debt? Getting sued is stressful. A sense of panic can set in after the process server or sheriff knocks on your door and hands you or someone in your home an envelope full of legal papers, or just leaves the envelope on your doorstep. But does a lawsuit mean you need to file bankruptcy right away to stop the lawsuit? Not necessarily. Even if you do end up filing for bankruptcy relief, you may not need to rush into anything IF you take the right steps to handle the lawsuit after you are served. While advice will differ depending on the specifics of the lawsuit and your overall financial situation, there are a few things you should know about how lawsuits over debts are handled. In Minnesota, you have a short window of time to "Answer" the Complaint in writing. The deadlines for this will normally be spelled out on the first few pages of the legal documents. In Minnesota, your Summons should state that you have 20 days to respond. The clock starts running the day you are served. But be aware that this time frame can be shortened if you send your written response by mail, fax, or by any means other than by hand delivery. Pro tip: don't bother calling the lawyers who sued you. If you do call, they are likely to be friendly and supportive and willing to "work something out", but this is often just a stalling tactic to prevent you from asserting your rights by serving a written response. It is critical that you Answer the lawsuit on time! If you do Answer in time some really good things happen. Well, good in the context of a bad situation. First, you will have to be notified by mail when anything further happens with the lawsuit (if you don't answer you will likely not be notified when the judgment is entered against you). Second, you will buy yourself time -- often an extra six months or more -- to figure out a way to deal with things while the lawsuit proceeds, potentially delaying any garnishments. People can and do successfully Answer Complaints without a lawyer's assistance. But you should contact a lawyer or at least a free legal aid service quickly to make sure your are handling things correctly. Even if you don't think you want to go to court you still have the right to Answer the lawsuit to make the creditor prove its case and verify the amount it claims you owe. If a judgment is entered against you, it's time to get serious about solutions, perhaps even bankruptcy. But you should know that If you do end up discharging the debt - in bankruptcy or otherwise - there is a procedure that will remove the record of a Minnesota judgment from your credit reports. We can help you with this process as part of a credit cleanup service. Whether or not you end up filing bankruptcy, my office routinely advises folks about how best to handle a lawsuit. Feel free to call me if you are ever sued over a debt so we can guide you. Just don't delay! The U.S. Department of Justice has published new median, gross income data for use in bankruptcy cases filed on or after November 1, 2016. For Minnesota residents, the figures have increased, making it more likely that you will qualify for Chapter 7 relief. The new figures are available on the Means Testing section of this site. The numbers for all federal districts as of November 1st are available on the DOJ's website. The increase for additional household members above the first four remains the same, at $8,400. A reminder: the median income amounts are only part of the analysis for determining whether you qualify for Chapter 7 relief. You can sometimes be over the amount and still qualify after completing the full, long-form means test. How to count household income can be tricky as well, depending on sources (social security benefits do not count, for instance) along with the amounts that are contributed by other household members. And calculating your household size is not aways as straightforward as you might think. As always, consultation with a qualified, experienced bankruptcy attorney is critical. But if you're struggling with debts, starting next month it is going to get a little easier to qualify for relief.